The TSA’s had a rough week. First they’re forced to stop groping the elderly, and then Matt and Trey lambast them on Comedy Central. I’ll wait, if you’d like to get out your violins. The backlash from recent reports of the TSAs handling of passengers who are advanced in years led to a change in their policies concerning members of the public over 75 years of age. This follows on the heels of a move by Orlando Sanford International Airport to evict all TSA personnel, replacing them with more “customer friendly”, private security staff. US Rep. John Mica, who authored the bill which led to the creation of the TSA following the 9/11 terrorist attacks, believes that the agency has grown too bureaucratic and bloated. “I want to get it [TSA] out of the human resources business and back to security,” said Mica. Meanwhile, South Park’s debut episode of season 16 mocked the agency’s perceived incompetence. In one particularly epic scene (linked above), a TSA agent monitoring numerous surveillance videos of people on the toilet, masturbated to the images for a full minute, intermittently helping himself to handfuls of moisturizing lotion. The portrayal of agency employees as overweight, uneducated, superfluous buffoons only adds to the bad press the TSA has received in the last few months. Hell of a show, though. Watch the full South Park episode here. 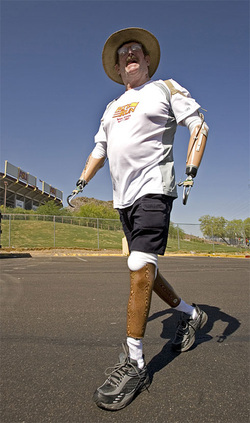 It was reported on March 12th that the TSA at Phoenix Sky Harbor International Airport routinely subjects a quadruple amputee to an “aggressive” body search, removing and inspecting each of his four prosthetic limbs, often examining them via x-ray machinges, prior to clearing him to board his flight. This, despite the fact that all of the TSA agents at Phoenix know the man in question, Jeff Lewis, by name. As they remove each of Jeff’s limbs, he’s left as little more than a torso, waiting for the agents to finish their inspection. Jeff’s story is just the latest in ridiculous TSA abuses of civil liberties. Take the case of Thomas Sawyer, bladder cancer survivor, who was left “crying, humiliated, and covered in his own urine” after a TSA patdown. After the cancer ravaged his bladder, Sawyer was forced to use a urostomy bag, which collects his urine through an opening in his body. Despite having informed the TSA agents of his predicament, the officers subjected Sawyer to a forceful search, breaking the bag open in the process. [The TSA agent] described to me that because I had opted out of the backscatter screening, I would now be patted down, and that involved running hands up the inside of my legs until they felt my groin. I stated that I would not allow myself to be subject to a molestation as a condition of getting on my flight. The supervisor informed me that it was a standard administrative security check and that they were authorized to do it. I repeated that I felt what they were doing was a sexual assault, and that if they were anyone but the government, the act would be illegal. I believe that I was then informed that if I did not submit to the inspection, I would not be getting on my flight. I again stated that I thought the search was illegal. I told her that I would be willing to submit to a walk through the metal detector as over 80% of the rest of the people were doing, but I would not be groped. In Tennessee in October, a viper team used radiation monitors and explosive-trace detectors to help state police inspect trucks at highway weigh stations throughout the state. Last month in Orlando, Fla., a team set up metal detectors at a Greyhound bus station and tested passengers’ bags for explosive residue. At the Charlotte train station on Dec. 11, Seiko, the bomb-sniffing dog, snuffled down a line of about 100 passengers waiting to board an eastbound train. And its only going to continue. The VIPR program is about to receive an increase in personnel and funding, to the tune of 24M dollars. This is on top of the program’s 110M dollar 2011 budget. And that’s just VIPR. The run-of-the-mill invasion of privacy that we’re used to encountering in airports costs the American people 5 billion dollars on an annual basis. As we discuss cutting basic human services around the country, laying off teachers, firefighters and police officers, why are we being forced to increase funding for an agency which time and time again has displayed an utter disregard for human dignity?